So Stella had her two-year check-up today. She received two shots, a delicious wooden tongue depressor, fabulous height and weight percentiles, and a small bit of forgivable misinformation. I’m not sure how I will broach the latter with the doctor, but I plan to do that soon. To kick things off, he asked about Stella’s vision. I explained the high-level details about her glasses prescription, patching, and the plan to do vision therapy in order to get her eyes to work together. He nodded, remarked that his brother had ambylopia, and said that we’ll probably have to patch (and do vision therapy, I suppose) intensively for “a long time.” He said that the pressure is on and at the same time the road long because it’s an eight-year process. After age 8, he explained, there’s nothing you can do for the weak eye because the brain shuts down the associated neurons. Yet I just read in the extremely well-researched Fixing My Gaze that this is actually not the case for most “strabismics.” The idea of a critical early window for correction of ambylopia and other strabismus-related vision issues has been shot down by Dr. Susan Barry (author of Fixing My Gaze) and other experts. Don’t get me wrong–I’m not flipping out about this contrasting bit of medical advice. I know that treating eye issues early is an excellent idea that improves outcomes. I’m not at all upset with the well-meaning doctor but I want to offer him relevant resources so that he may better guide and give hope to other patients. Stella weighs 27 pounds, which puts her between the 50th and 75th percentiles. She’s 36 inches tall, which lands her at the 95th percentile. Sigh. Actually, we’ve discovered a new diagnosis in our family and I will touch on that in a future post. It explains so much. But for now, I’ll expound upon our insanity regarding Stella’s weight. Worry lingered because many openly note how lean Stella is, and those comments can really come across the wrong way and reinforce old fears. Because sometimes she’s too busy to eat and we see that through a filter of our distant tube-feeding past rather than viewing it as the normal toddler behavior it is. Because she just went on a long trip to the east coast, started wearing an eye patch, had two pesky gastrointestinal bugs in the past four weeks, and has been known to throw eating pretty much out the window in the face of disruptions. Because despite our intellectual understanding that she has long been healthy and happily eating to fuel perfectly Stella-appropriate growth, we remained a little too vigilant. To his immense credit, the doctor must have understood the essence of all this. He paused to celebrate her growth, acknowledged all we’d been through when she was an adorable but feeding-averse baby, and then he smiled at me and said, “It’s over.” Those words hit me like a truck. This is a new era. She’s two. She is three freaking feet tall! And she’s fine. Glasses, eye patch, temper, and all. I feel it in my bones now. Worry doesn’t ever go away when you’re a parent, but right now, for the first time perhaps since Stella was born, I know she is okay. We are okay. It’s all okay. I get it. For real this time. Pinky swear! 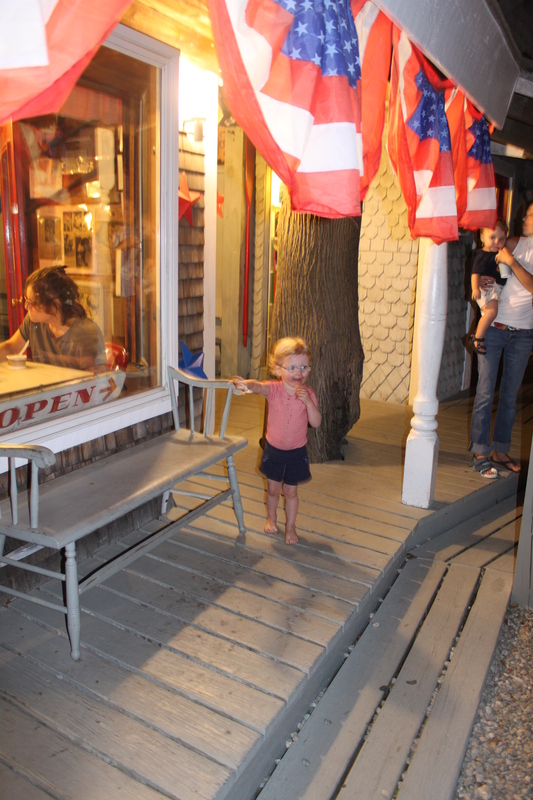 Stella ate her weight (27 pounds) in deliciously high-butterfat ice cream at FarFar's Danish Ice Cream Shop in Duxbury, MA. This entry was posted in Family update, Milestones, Stella's eyes and tagged accommodative esotropia, farfar's in duxbury, feeding aversion, fixing my gaze, growth percentiles, patching, strabismus, susan barry, toddler, two years old, vision therapy. Bookmark the permalink. 3 Responses to Stella’s weighty two-year check-up. Go Stella!!!! I was thinking that bathing beauty (of two posts ago) had a nice looking belly on her. Thank you FarFar! Wow – Those words, “It’s over” brought tears to my eyes. While I’ve never met you, I feel as thought I know you (and Stella) – and know the immense joy of allowing myself to finally accept that an incredibly challenging journey is actually over. Yes, it can truly be over. Hey Meg, I just wanted to thank you for your comment–it really stayed with me. I’ve read your blog in the past and know you’ve been through a lot! Glad you were able to come out the other side of a tough challenge, too. You have every ounce of my respect… you seem like one hardworking single mom! HATS OFF!